The municipal stadium Szamotuły has been the home of local team Sparta ever since the football side was established in 1922. Always in public property, the stadium was first managed by SOSiR, then in 2014 was transferred to SCS, new municipal entity. It offers three independent stands on landfill, with only a section in the west being covered and equipped with player infrastructure. The north side is open, while the south remains terraces and is thus mostly unused. Total number of seats stands at 2,377. Since 2012 the stadium is named after Stanisław Kurowski, local football coach who managed to lead the youth team from Szamotuły to national level of Polish championships in 1953, beating the renowned Górnik Zabrze in the process. Due to low ticket demand, capacity is limited to roughly 990 for football games. Commonly known as the Pogoń stadium, this football ground no longer hosts Pogoń, because the team was dissolved in 2013. Located almost outside of town, the stadium’s most distinctive feature are rows of seating places between large trees. While it may look charming, this means that in practice many of the seats offer severely obstructed views. 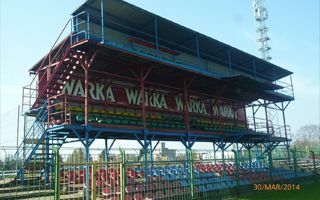 Located almost at the heart of Pniewy, the stadium has two stands along northern and southern sides of the pitch, each offering 6 rows each. Southern steel tower became recognizable nationwide with its two levels of covered seating, both atop the actual stand. In 1990s the stadium played host to Poland’s top tier football, as local team was boosted financially by regional sponsor, the Miliarder weekly magazine. Once the publisher’s support seized after two seasons, the team was relegated to the 4th league in 1996, but local fans still recall beating Legia Warszawa 1:0 in 1994, with a sell-out crowd of 3,000.